DVDs 1354 https://www.warplane.com/images/Products/1354.jpg This DVD was compiled from nine original Avro Aircraft 16 mm silent films shot during the Arrow's construction and testing program. It contains excellent reference material with numerous scenes of the Arrow, including its ground support equipment. For the modeller there are hundreds of scenes which can prove useful for model detailing. Even if you are not interested in modelling the Arrow, these films make fascinating viewing by showing what went into the building and testing of the Arrow. 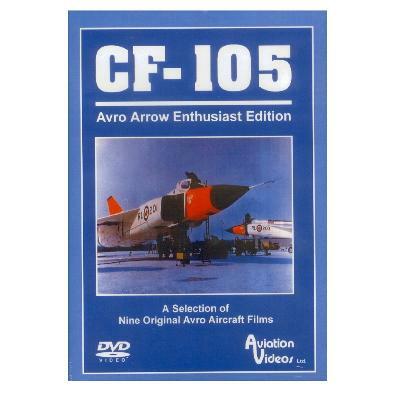 Description: This DVD was compiled from nine original Avro Aircraft 16 mm silent films shot during the Arrow's construction and testing program. It contains excellent reference material with numerous scenes of the Arrow, including its ground support equipment. For the modeller there are hundreds of scenes which can prove useful for model detailing. Even if you are not interested in modelling the Arrow, these films make fascinating viewing by showing what went into the building and testing of the Arrow. Additional Info: Arrow 202 In Flight - Takeoff of 202, as seen from the air, air to air shots, landing, Orenda engine plant from the air, Avro plant from air, Arrow as seen from chase plane landing, and taxiing medium to close-up shots. Colour. 10 minutes. Arrow Ground Support Equipment - Arrow 203 and ground support equipment, ground handling equipment; Sparrow missle weapons pack installation, Sparrow missile assembly, Arrow 203 medium and close-up shots; Arrow 203 being towed; Arrow 203 undercarriage, Fueling and engine testing. Colour. 13 minutes. Arrow Undercarriage - Air to air shot of gear extending and retracting, close-up of main undercarriage testing and operation during taxiing. Colour and B&W. 8 minutes. Arrow 201 Engine Testing - Preparing Arrow 201 for engine testing; installing equipment in weapons pac; and ground support equipment truck. Colour. 11 minutes. Flying Arrows - Excellent footage of arrow numbers 201 through 205, scenes include takeoffs, landings, taxiing and air to air shots. Colour. 7 minutes. Avro Arrow Assembly - Consrtuction and assembly of the Avro Arrow fuselage and wings. Colour. 23 minutes. Arrow Escape Trials - Ejector seat testing, and Arrow crew escape sequence trials. Colour and B&W. 3 minutes. 3D Model Of Arrow Production Line - Complete model of the whole Avro Arrow assembly line, including model Arrows, building of models, assembly line and close-up of sections, modeller working and shots of the whole production plant model. Colour. 17 minutes. Arrow Taxi Trials Close-up of the Arrow being towed, preparing for taxi trials. Arrow 201 taxi trials, Arrow 201 parked and close-up of pilot exiting aircraft and more taxi trials. Colour. 12 minutes. Colour and B&W. 104 minutes. ALL SILENT. Format: NTSC Region 1 (U.S and Canada only).